Commissioned by 32 Regiment Royal Artillery. 32 Regiment Royal Artillery deployed batteries on 14 tours of Operation HERRICK from May 2006. Soldiers of the Regiment operated Hermes 450, Desert Hawk and Tarantula Hawk unmanned air systems in support of UK, US and Afghan forces until the end of combat operations in December 2014. 32 Regiment Royal Artillery has provided Imagery Intelligence and live video feeds to a number of units and organisations, including Headquarters, Infantry Battlegroups and UK Special Forces. 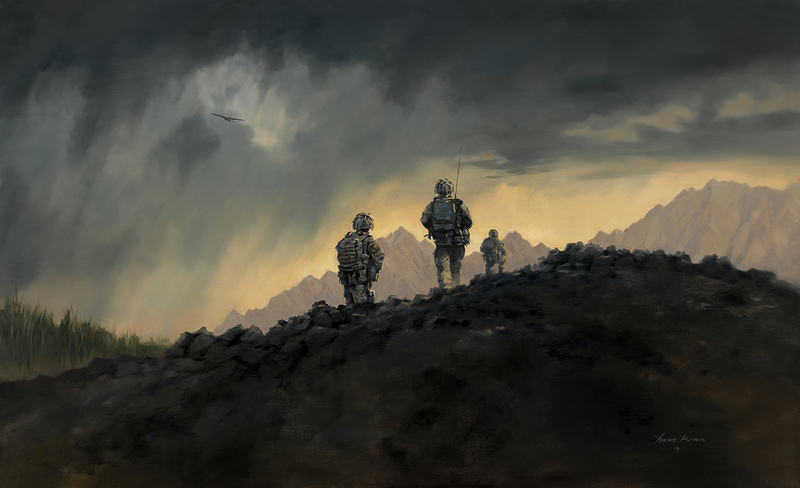 This painting is dedicated to the officers and soldiers of the Regiment and their families.